PHOTO CAPTION: Simone Dinnerstein (l) and Tift Merritt (r), powerful musicians – each in her own genre – join forces on the newly released CD Night (Sony Classical) and in a local CD debut concert at Club Helsinki, Hudson, on Saturday, March 23rd beginning at 8 pm. The concert, presented by ClaverackLanding, showcases a collaboration between one of classical music’s most recognized and gifted pianists and a folk music singer-songwriter who has worked with Elvis Costello, Joan Baez and Kris Kristofferson. For tickets ($30.00 each) and further information go to www.ClaverackLanding.org or call Club Helsinki directly at 518.828.4800. HUDSON – Tift Merritt learned to play guitar by ear from her Father. She has spent almost her entire life writing songs, recording and exploring the world of folk music. Her debut album, Bramble Rose, was on the top ten lists in both Time Magazine and The New Yorker. Her second album, Another Country (including songs written during a voluntary residency in Paris) prompted Emmylou Harris to say, “She [stands] out like a diamond in a coal patch.” Not content to sit on her laurels, album number three gave The Wall Street Journal an opportunity to place her “in the tradition of Joni Mitchell, James Taylor and Leonard Cohen.” Pretty good creds. Simone Dinnerstein, on the other hand, learned to play classical music first at the Manhattan School of Music, then at Julliard, and finally, in London with master teacher Maria Curcio. Her professional recording began with a self-financed CD of Bach’s Goldberg Variations in 2007. The disc rapidly appeared on a number of “Best of” lists including The New York Times, The Los Angeles Times, Amazon.com’s Best CDs, and Barnes & Noble’s Top 5 Debut CDs of 2007. Her album Bach: A Strange Beauty, released in 2011 by Sony Classical, debuted at No. 1 on the Billboard Classical Chart. She went on to garner the No. 1 top selling spot at Barnesandnoble.com and No. 2 over-all on Amazon.com – in the unlikely company of Cake, The Black Keys and Bruno Mars. Still, back in 2008 when they decided to work together, these two strong women, each with solid standing in her genre, were taking a substantial risk. Beginning with a curiosity about each other’s process (discovered while performing at an Obama fundraiser), the collaboration became more concrete during a residency they shared at Duke University in Durham, North Carolina. The school’s Director of Arts, Aaron Greenwald, was captivated by their unique proposal and worked at sourcing funds in order to commission two composers to write songs for the pair. Most important,” says Merritt, “we had a 5-day residency – time for us to rehearse and work together.” As a result of their exploration, the pair presented two concerts. But more importantly, they were hooked on the collaborative process between classical and folk. Fast forward to 2012 when the results of the two musicians’ explorations bore fruit on the new album, Night. Dinnerstein says, “This album has been about pushing our creative boundaries. I’ve learned from Tift to be a good band member, not use too many notes, let the words come through and keep an edge and rawness to the improvisation.” Not the standard mantra for a classical pianist. At Club Helsinki, where the ClaverackLanding sponsored concert will be only the second live performance of the just released CD, the audience will be able to judge for themselves how these two independents have become a “genreless” duo. Pieces from the album will include music written by Merritt as well as other folk song writers. Also included will be a CD world premiere of The Cohen Variations by Daniel Felsenfeld, commissioned and performed exclusively by Dinnerstein and based on one of her favorite songs, Suzanne. The evening begins at 8 pm on Saturday, March 23rd. 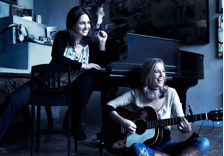 Presented by ClaverackLanding, Simone Dinnerstein & Tift Merritt will be at Club Helsinki, 405 Columbia Street, Hudson. Tickets are $30.00 each and can be purchased on line at www.ClaverackLanding.org. Call 518.828.7513 for more information or Club Helsinki directly 518-828-4800 to purchase tickets. Watch an excerpt of NIGHT from WNYC, New York Public Radio at http://bit.ly/NIGHTWNYC.